The N12 bridge, which has served road users for well over 50 years, is now an impressive structural masterpiece. In line with SANRAL’s Transformation Policy, R20-million of the R100-million budget for this project was earmarked for SMME development. 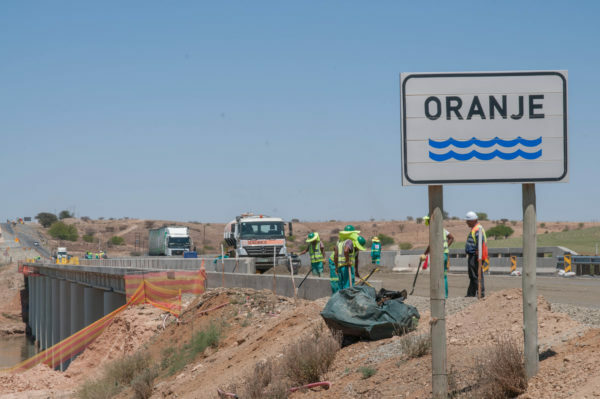 The countdown until the first vehicles roll over the for the refurbished bridge over the Orange River on the N12 outside Hopetown in early 2019 has begun. Construction started in 2016 and, notwithstanding some challenges along the way, including working under live traffic conditions and violent protests in the Northern Cape that at times halted construction, the work is on track. What was once a 9.3m bridge that has been serving road users for well over 50 years, is now an impressive structural masterpiece with a width of 15.4m, significantly increasing the capacity of the N12 as a major industrial and commercial artery between the Northern Cape and, particularly, the Western Cape. Tiago Massingue, SANRAL Project Manager, said: “Building piers for a 12-span bridge in the Orange River was no walk in the park. We had to time our work carefully, taking seasonal rainfall, the strength of the river, environmental regulations and most importantly, the safety of the workers into account every step of the way. In line with SANRAL’s Transformation Policy, R20-million of the R100-million budget for this project was earmarked for SMME development, which not only created a platform for economic growth of small businesses in the surrounding areas, but directly impacted on job creation for the local community. Abraham Swartz from Hopetown, one of the subcontractors on this project, is incredibly proud of the 10 residents he is able to give gainful employment to. “I have learnt so much from the main contractor, particularly on safety practices on site. It was my first time working on a project of this magnitude and I am grateful to SANRAL for giving us small businesses the opportunity to work alongside the big players and be capacitated for long-term sustainability,” said Swartz. Upon returning to site early in January, there were just a few finishing touches to bring to life a majestic concrete creation that is ready to serve road users for the next 50 years.